The RWG for the Scheldt identified the provision of Ecological Function & Diversity as the most important high level function within the estuary, followed by Flood Protection & Assimilation. The provision of Transport & Accessibility was scored just below the average for the TIDE estuaries. Figure 19: Scheldt uses/issues importance weighting. The RWG high level importance assessment for the 4 main topic areas for the Scheldt were scored at the mean for the TIDE estuaries. 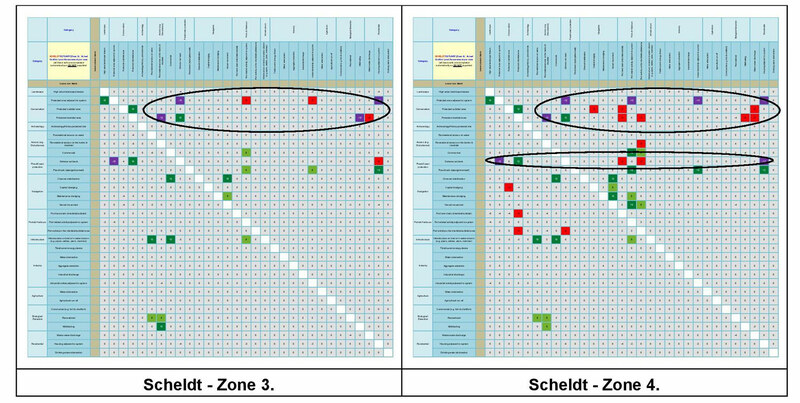 For the purposes of the conflict matrix analysis the Scheldt system was divided into 6 management zones (Figure 20). As with the other TIDE estuaries, the majority of the intertidal and subtidal area of the Scheldt is protected under EU Directive as a Natura 2000 site, with only the extreme upper reach of Zone 1 excluded from this. Zones 1-3 are located upstream from the City of Antwerp and feature a relatively narrow dyked channel running through a mix of agricultural land with small urban areas. Despite the embanking, there are areas of intertidal marsh as well as realignments, e.g. the Kruibeke site. The main urban centre of the City of Antwerp is located within Zones 4 and 5, with the estuarine width increasing downstream from the conurbation. The port area extends through much of Zones 4 and 5 and includes extensive modifications to morphology and channels (e.g. Kanaaldok and the Schelde-Rijnverbinding) as well as land claim around Doel. There are however extensive intertidal marsh and mudflat habitats in this zone (between Doel and Kruispolderhaven), including areas of managed realignment. Zone 6 features a further widening of the estuary towards its mouth and includes the Westerschelde. The zone includes large areas of intertidal and subtidal habitat included within the Natura 2000 designation, but also with the port complex of Flushing-Nieuwdorp. The conflict matrix analysis process for the Scheldt (Figure 20) recorded only four high scoring conflict interactions (Table 5) across the estuary as a whole, but with some specific issues identified for some of the zones. For instance, whilst Zone 2 recorded a high score interaction of conservation protection of the intertidal zone was noted on recreational access on the flood protection banks and intertidal mudflat, the pattern and scoring of most user interactions in this Zone being very similar for the estuary as a whole. However, Zones 3 and 4 feature an increased number of high scoring interactions, these detailed in the following text. 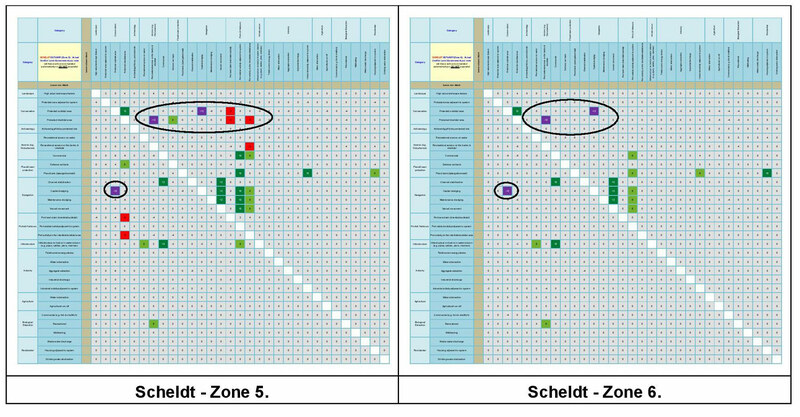 Strong negative and positive associations for the Scheldt are provided in Tables 5 and 6 respectively. 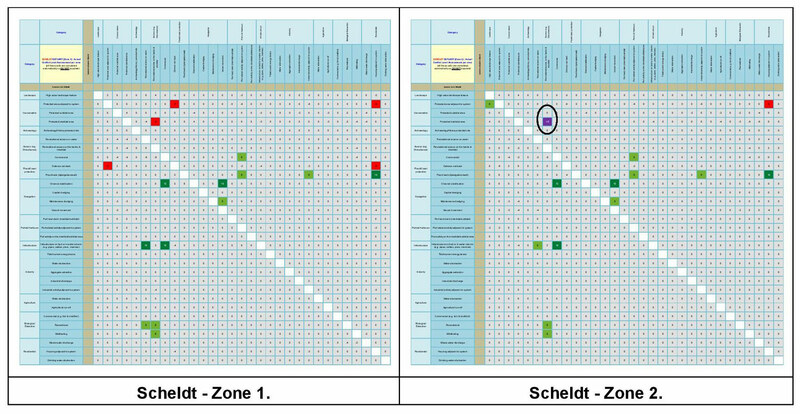 Figure 20: Scheldt - high scoring user interactions per zone. Table 5: Strong negative associations between uses/users for the Scheldt Estuary. Table 6: Strong positive associations between uses/users for the Scheldt Estuary. Zones 1 and 2 (Figure 21a) are located upstream of the City of Antwerp and within a mix of agricultural land with population centres. Vessel traffic and partial Natura 2000 inclusion recorded generally a low frequency and intensity of conflict scores, although a high score interaction of conservation protection of the intertidal zone was noted on recreational access on the flood protection banks and intertidal mudflat in Zone 2. However, a number of high scoring synergisms were also recorded from these zones including flood protection and the provision of residential housing; infrastructure and recreational and commercial access; and channel stabilisation and navigational issues. Figure 21a: Main Conflict Scores for the Scheldt Estuary. 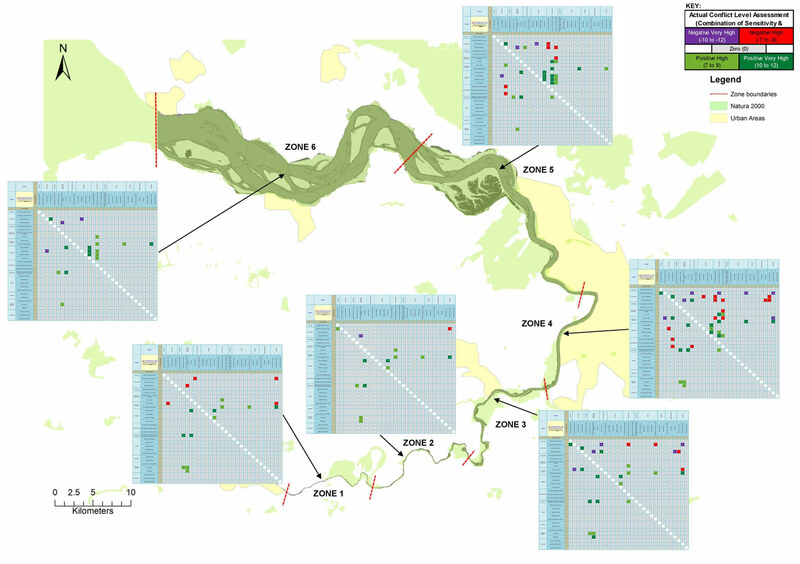 Zone 3 (Figure 21b), immediately upstream from the centre of Antwerp featured an increased number of high scoring interactions, including conservation protection adjacent to the system impacting on flood protection and housing provision; conservation protection of the intertidal zone on recreational access along the banks and intertidal as well as wildfowling, whilst the setting back of flood defences was identified as impacting on protected conservation areas adjacent to the estuarine system. Notably however, no high scoring antagonistic interactions were noted on users resulting from aspects of navigation provision and port and port related activity. Zone 4 (Figure 21b) which covers much of the City of Antwerp frontage, some of the port facilities and is also included within the Natura 2000 designation featured a considerably higher number of user conflicts, many of these high scoring. The conservation protection afforded habitats adjacent to the system were recorded as having a high conflict impact on flood defence realignment, port related activity adjacent to the estuary, and industrial development and housing provision in the same area. Conservation protection of the intertidal area was also recorded as having a high conflict on recreational activity along the banks and intertidal area. The setting back of defences was identified as having a high impact conflict on the protected conservation areas adjacent to the system and housing provision. However, a large number of synergisms were again recorded. Figure 21b: Main conflict scores for the Scheldt Estuary. Zone 5 (Figure 21c) which covers the reach along the main port area of the Antwerp conurbation, also includes some areas of agricultural land as well as intertidal marsh and mudflat together with mid channel banks, this intertidal habitat included within the Natura 2000 designation. The reach also features increased vessel traffic as it handles maritime port traffic to Antwerp. However, the results of the conflict assessment process indicate that moderate to high scoring conflicts (coloured red and purple in the Figure) occurring between a range of users in this reach are somewhat reduced from upstream (by around a half). High scoring conflicts however remain from conservation protection of the intertidal area on recreational access along banks and across the intertidal zone, but also from conservation protection of the subtidal habitats on capital dredging activity, with a reciprocal high scoring conflict identified. Zone 6 (Figure 21c) covers the outer Scheldt estuary which includes Natura 2000 protection, this reach featuring a number of mid channel banks and islands as well as extensive fringing mudflats and marsh. Adjacent land-use is primarily agricultural with dyke protection along the length of the reach. Some port related activity occurs around Flushing-Nieuwdorp, and the main channel is maintained for navigation requirements to the port of Antwerp and upstream. High scoring conflict interactions are further reduced, and relate to the impact of intertidal habitat conservation protection on recreational access and subtidal conservation protection on capital dredging. As with Zone 5, a reciprocal similar high score is identified for the latter interaction. A pattern of similar synergistic interactions is identified for Zone 6 as for Zone 5. Figure 21c: Main conflict scores for the Scheldt Estuary. It is interesting that the despite the number and severity of conflict interactions identified for the Scheldt by the RWG, these are somewhat lower than for the other TIDE estuaries, particularly given that the RWG rated the importance of the provision of the four high level usage functions at the mean for the TIDE estuaries with Ecological Function and Diversity rated as the most important. Furthermore, the use level scores from the Scheldt for all zones (Figure 9) was higher than for the other TIDE estuaries, the use level score being 10% higher than the mean for the TIDE estuaries. As such, it might be expected that the number and severity of user conflict interactions would be at least comparable to those of the other TIDE estuaries, and the relative low frequency of high scoring conflict interactions from the matrices would therefore indicate that either the management of conflicts on the Scheldt is more effective than on other TIDE estuaries, or that the generic scores attributed to the conflict interactions by the RWG are lower across the estuary. The highest level of use on the Scheldt was recorded for the oligohaline section of the estuary, and this correlates with the highest number and severity of user conflicts identified from the conflict matrix process. This will be discussed further, later in this report. The outcomes from the Scheldt analysis are also of interest in that whilst the use level scoring indicates substantial ports related activity including navigation uses in the mid to outer estuary (oligohaline to polyhaline), together with conservation protection (HSD) in the same zones, the number of severe conflict interactions between components of these two uses are relatively infrequent when compared to the same interaction combinations from the other estuaries. Furthermore, the scoring of these interactions indicates that there is some asymmetry between the two user topics in terms of severity of impact, with higher conflict scores identified from the impact of conservation protection requirements on navigation and ports activity, than from navigation and ports activity on conservation protection needs. This is atypical in terms of the responses seen from other TIDE estuaries and would appear to indicate either an effective navigation and ports management strategy in terms of impacts to the Natura 2000 protection requirements, or perhaps it is an artefact of the RWG perception of issues. This will be discussed further, later in the report. Section 8 (Appendices) provides the Conflict Level Assessment spreadsheets for Zones 1 to 6 of the Scheldt in greater detail (larger scale).